When you have a day, week or month to celebrate or raise awareness of everything from diseases to foods it can be easy to overlook some of the very best ones. 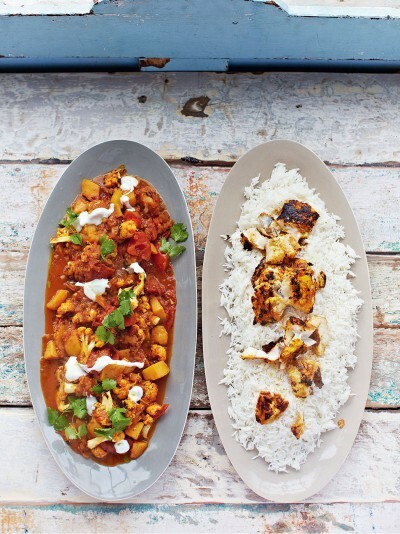 National Curry Week is currently being celebrated and is into its 19th year with more and more people getting involved by going out to their local restaurants or even trying their hand at making their own curries for family and friends. National Curry Week began in 1998 in an attempt to promote the huge variety of foods, and also to raise money for charities focusing on hunger and poverty particularly across South Asia. It’s hoped that people will take part in the initiative so that they can experience a range of curried food and experience a different culture to their own. To honour National Curry Week as best we can, we have come up with a super tasty menu you can use to hold your very own curry night. We’ll give you the recipes for three main courses as well as three side dishes to get you started. Happy cooking! Mix 100g plain flour, 1 tsp baking powder, 2 tsp chilli powder, 1 tsp ground cumin, 1 tsp ground turmeric and a pinch of salt together in a bowl and gradually add a little water until you have a thick and sticky batter. Slice 1 medium sized onion into strips and add to your batter. Fill a saucepan with enough oil to deep fry and make six balls from your batter mix. 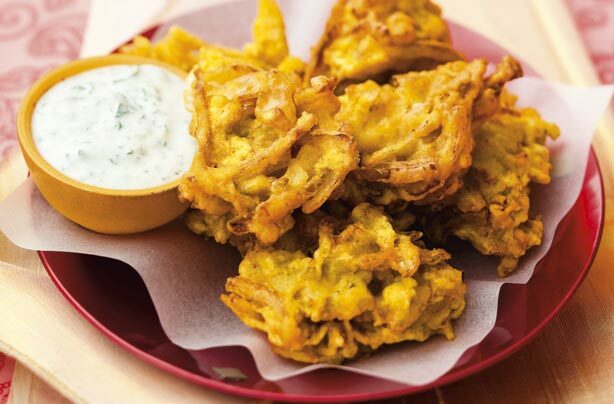 Wait until the oil is hot and place the balls into the batter, deep frying the bhajis for approximately two minutes until brown and cooked through. Remove from the pan and wrap in kitchen roll to absorb excess oil, and they are ready to serve. Heat 2tbsps of ghee or oil in a pan, add a sliced onion and cook for 4-5 mins. Add 1 diced clove of garlic, 1 diced red chilli, 1tbsp freshly grated ginger, 1tsp black mustard seeds, 1tsp cumin seeds and 1tsp turmeric to the pan and cook for a further minute. 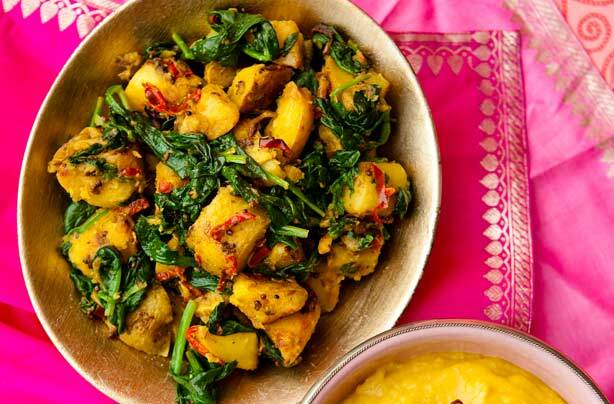 Add 500g cubed potato and heat for around 10 – 15 minutes, or until the potatoes are cooked. Add around 225g of spinach and stir until the spinach wilts. Season with salt and serve. Dissolve a sachet of yeast with 225ml warm water in a large bowl and leave for about 10 mins until frothy. Stir in 4tbsp caster sugar, 3tbsp milk, 1 beaten egg, 1tbsp salt, 880g bread flour and knead for around 8 minutes on a lightly floured surface. Clean and grease your bowl, add your dough and leave to rise in a warm cupboard for around one hour until the dough has doubled in size. Remove from cupboard, ‘punch down’ the dough and add 2 cloves of optional minced garlic and break the dough down into tennis ball sizes. Leave these to proof for another 30 mins until doubled in size. Brush a large pan with oil or butter and fry on a medium heat until each side has browned (about 3-4mins on each side). 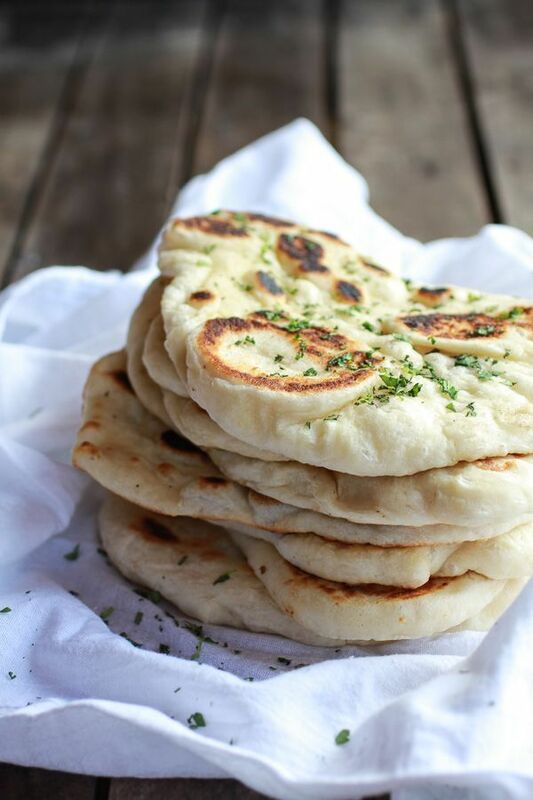 Brush with a touch of melted butter and a sprinkle of shredded coriander and serve! Mix together 4 cubed chicken breasts, 1tbsp diced root ginger, 1tsp mild chilli powder, 2tbsp fresh coriander and 1tbsp oil in a bowl and leave aside. Heat a large pan & add your chicken/marinade to the pan and fry for around 6-8mins. In a separate pan, heat another splash of oil and add one diced onion & one diced red chilli and cook until soft. Add 1tsp ground turmeric and fry for a further minute. Lower the heat, pour in 300ml double crea m and simmer for around 3 mins. Add the chicken marinade from your other pan and simmer for around 5 minutes or until the chicken is cooked through. Add a little lemon juice to flavour and enjoy it’s ready to enjoy. Cut a lemon in half and squeeze the juice of one half on a plate with 1tbsp of tikka paste and mix together. Massage the paste into 400g of frozen fish fillets and leave aside to marinate (the longer you marinate the fish, the more flavoursome it will be, so the timing is up to you). Fry up 1 onion, 2 diced cloves of garlic, 1tbsp grated root ginger, 2tbsp tikka paste, 1 diced fresh red chilli and 15g fresh co riander on a medium heat with a splash of oil. Also add 300g diced potato and fry together for 15 mins or so, or until the potatoes have softened. Add 2 quartered tomatoes, 50g split red lentils and 300g frozen cauliflower florets with 600ml boiling water to your fried potato mix and leave to simmer for around 45mins or until the lentils are cooked. The sauce should thicken nicely but you can add a splash of water if it does look like it’s drying up a little. Dry fry the fish for around 3-5mins on each side until coloured and crisp and then stir in 2tbsp of natural yoghurt to the main mix to help make the curry creamy and to take away some of the spice. Serve with rice and a few lashings of cool yogurt. Preheat the oven to 220*C/Gas7/Fan 200*C. Pour 2tbsp oil into a large oven roasting dish and put in the oven for 2 mins to heat through. Add 1 mall cauliflower, 2 large sweet potatoes and 1 large onion (all diced) and stir, making sure to coat the mixture with hot oil. Put in the oven and cook for around 15 mins until the veg begins to brown. In the meantime, mix 1 litre of warm vegetable stock with 3tbsp hot curry paste, 1 finely chopped red chilli, 1 pinch saffron strands and 2tsp mustard seeds. Once your 15 mins are up, add 500g basmati rice and 140g trimmed green beans to your veg and pour the stock on top. Cover the dish with foil and cook for another 30mins until rice is cooked. Once cooked, stir in 3tbsp lemon juice and scatter over some shredded coriander leaf and 50g cashew nuts. We hope we’ve made a few mouths water and inspired a few of you to create your own dishes. Make sure you send us or tag us in any of the dishes you do decide to make!